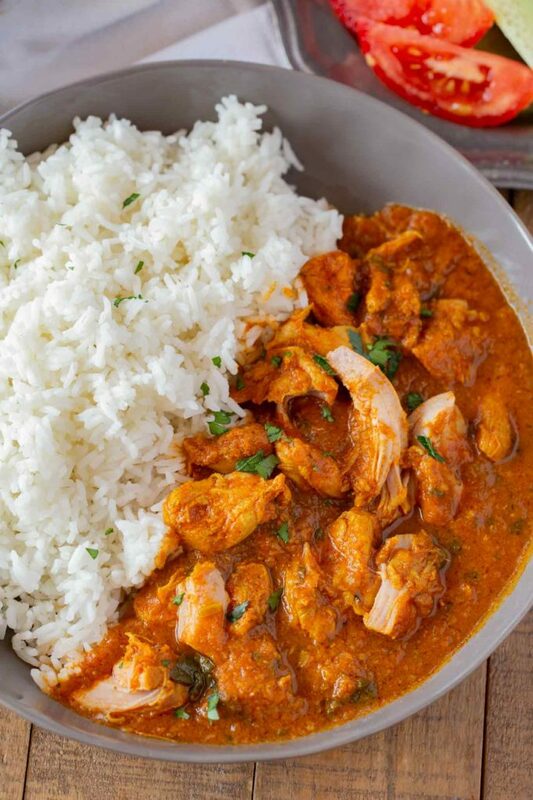 Indian Chicken Curry is creamy and savory, made with chicken breast in a seasoned yogurt and tomato sauce, ready in 30 minutes! 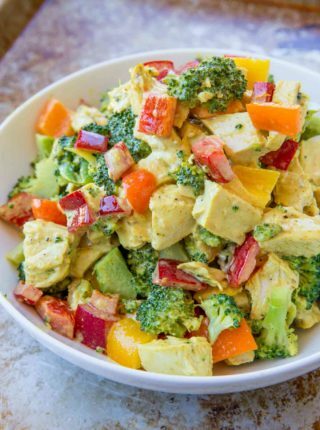 We love making flavorful curry dishes, and this week we’re meal prepping for Curry Chicken Salad, Thai Pineapple Chicken Curry, and Mango Curry Chicken Salad! 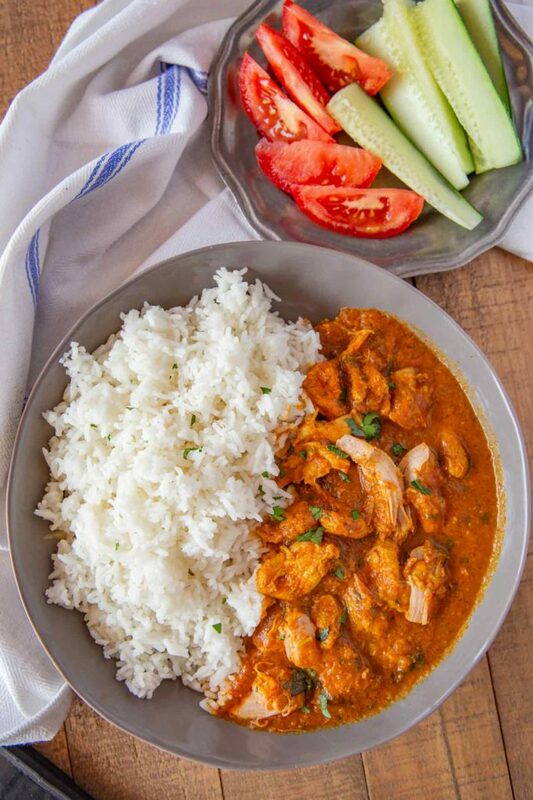 Indian Chicken Curry is savory, creamy, and a little bit spicy, made with lean chicken breast, fat free yogurt, diced tomatoes, and seasoning. I like to serve this Indian curry dish over basmati rice, with extra yogurt and cilantro. You can also serve with naan instead of rice, or lighten up the dish with spaghetti squash or cauliflower rice. This is a great recipe to make ahead, because the flavors only come together more as it sits in the refrigerator. We always order this dish at our favorite Indian restaurant, but today I’m excited to share a lightened up version of this curry that you can make any day of the week! You can thicken curry a few different ways. Try adding 3-4 tablespoons of tomato puree, stirring until combined. You can also try adding more yogurt, or just cooking the curry for longer until some of the water cooks off and the sauce thickens. 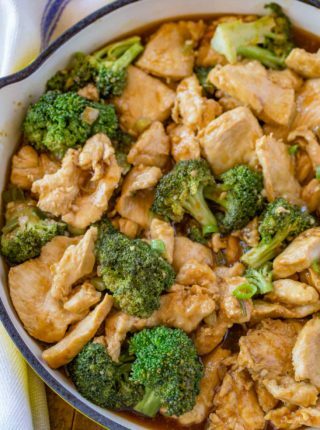 Spray a skillet with vegetable oil and cook chicken breast until browned on both sides. Place chicken in slow cooker. Place onions, garlic, and ginger on top of chicken. In a large bowl, whisk together yogurt, tomatoes, and seasoning. Pour over chicken. Cook on high for 4 hours, or on low for 8 hours. Top with fresh cilantro and serve. Turn on the saute function and grease the bottom of the bowl with cooking spray. Add ginger, garlic, onions, and chicken. Brown on both sides. While the chicken is cooking, whisk together tomatoes, yogurt, and seasoning. When chicken is done, pour sauce over chicken. Seal the lid and pressure valve. Set on manual high setting for 8 minutes, then allow to naturally release. HOW LONG WILL CHICKEN CURRY KEEP? Homemade Indian chicken curry will keep for 3-4 days in the refrigerator, sealed in an airtight container. CAN YOU FREEZE CHICKEN CURRY? You can freeze Indian chicken curry for 2-3 months when sealed tightly. This does have a yogurt base, so it won’t be as good as if it were just made after it has been reheated. 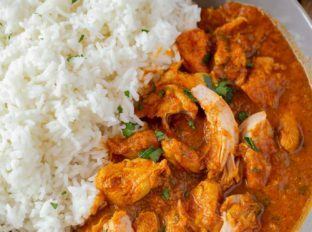 If you want to meal prep and freeze this Indian chicken curry recipe, I recommend cooking the recipe with the tomatoes and seasoning, but leaving the yogurt out. Let the curry cool completely and freeze. When you want to eat, reheat the curry in a large saucepan and add the yogurt at that time. Release some of the aromatic properties of the curry spices by sautéing them with the onion. You can also add a teaspoon of garam masala for more flavor (garam masala is also found in dishes like chicken tikka masala). If your curry tastes bitter, add a small amount of sugar to the recipe to balance the flavor. Add more veggies to this curry dish, like peas, green beans, or chopped spinach. 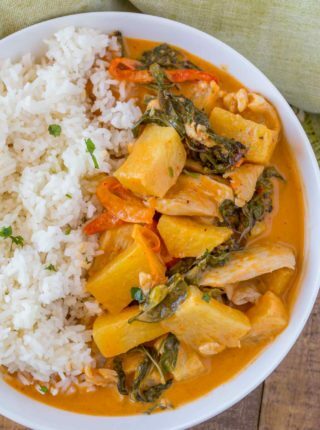 If you’re not a fan of yogurt, you can make this chicken curry recipe with a can of full-fat coconut milk (make sure it’s canned coconut milk, not the carton). The light coconut milk will not be as creamy. You can also use light sour cream. 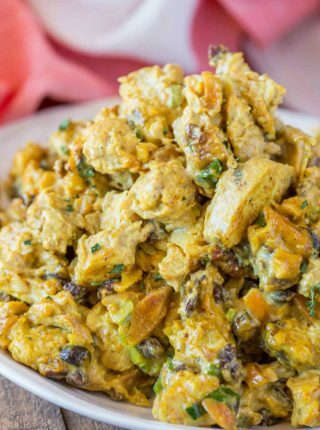 You can make this curry dish with leftover cooked chicken, like rotisserie, or use turkey or beef. If you’re using cooked meat, you only need to cook the curry dish until it’s heated through. You can make this as spicy as you’d like by adding more or less cayenne pepper. If it’s your first time making this dish or Indian cuisine in general, I recommend using less, because there are a lot of other seasonings in this recipe. Coat a large skillet with vegetable oil spray and cook the chicken breasts on medium heat and cook until cooked through, about 5-7 minutes then remove from the pan. Add the vegetable oil to the pan along with the onions and cook for 5-6 minutes, stirring occasionally until softened then add in the garlic and ginger and cook an additional 1-2 minutes. Add the curry powder, cumin, turmeric, coriander and cayenne and stir well for 30 seconds before adding in the tomatoes, yogurt, stirring well and cooking on low for 10 minutes. Add the chicken back in, stir well to combine and garnish with cilantro.